Santa Fe College Saints pitcher Michael Paul has not allowed a run in 16 innings pitched this season. 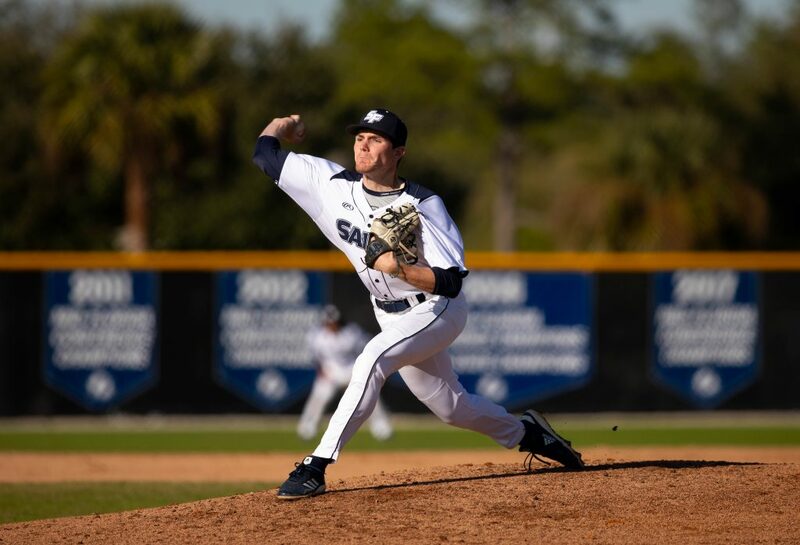 February 12, 2019 – It was business as usual at the Santa Fe Saints baseball field Monday afternoon as four Saints’ pitchers combined to throw a 13-0 shutout over Polk State College. Monday’s win was the eighth straight for the Saints (13-1) who are presently ranked No. 2 in the Florida College System Activities Association coaches’ poll and No. 12 in the National Junior College Athletics Association pre-season poll. Mathes got it done at the plate as well, with four hits and three runs batted in. The sophomore first baseman/pitcher now owns an 11-game hitting streak and has hit safely in 13 of the Saints 14 games. Next up for the Saints is a trip to St. Petersburg Wednesday to take on the Titans in a game scheduled to start at 3 p.m.